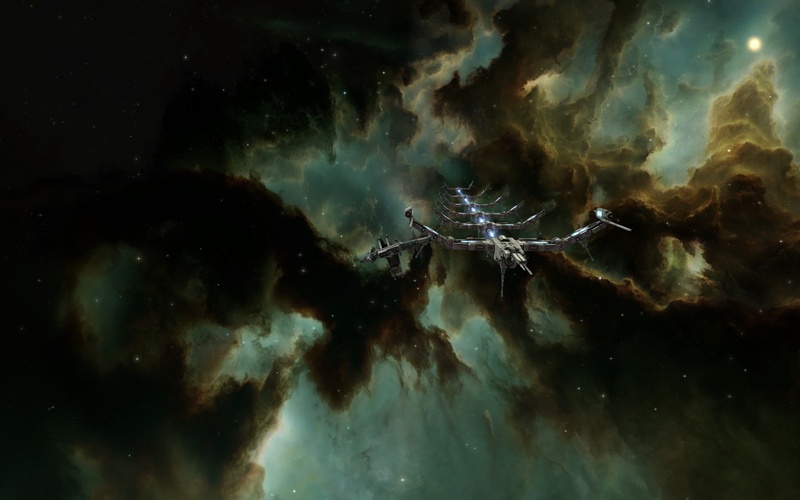 I played EVE Online for about 18 months, quitting in early 2010. I didn’t leave angry or disgruntled (i.e. as a so-called “bittervet”), it was more that with the limited time I had available to play, I wasn’t really getting anywhere. I still don’t have a ton of time to play, so what changed? Well… my coworker helped to talk me into resubbing. That plus EVE went on sale on Steam ($9.99 for the game; 30 days included). He’s also busy so we’re not going to storm New Eden or anything. Indeed, my personal goal is quite modest – if we can regularly meetup and play 2 hours a week, that’s good enough for me and I’ll play. The monthly fee doesn’t bother me, for a fun and very unique game. $15/month is less than what I play for Netflix and I spend way more time computer gaming that watches TV and movies. Anyway, the only drawback to the Steam sale was that it only applies to new accounts. It would mean giving up my previous account and a character that had 18 months of skill training. On the other hand, due to the changes over the last 3 years, plus the steep learning curve and similarly steep forgetting curve, I decided I could start over and not really miss much from my previous account. 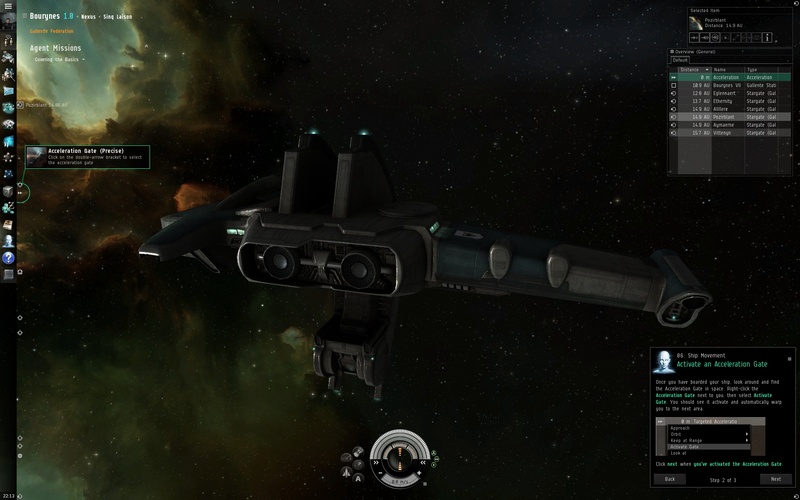 After a few hours setting up EVE on my Mac and PC, I was ready to play again! You are about to become what all men should fear. You will roam the heavens, commanding the most powerful machines ever built. So unbound, that not even death itself can claim you. For you are immortal, with all eternity to seize a destiny that is yours to define. But you are not alone with such power. Other demi gods roam these stars as well, and they are no less driven to succeeed or to rule, as you. There are more paths than one to greatness. If you have intellect, you will survive the darkest days. If you have courage, you will claim the bounties of man and nature. If you have patience, you will amass the wealth of empires. And if you can lead, there is no limit to what you can become. Dare to be bold, pilot. Forge your own path to greatness. 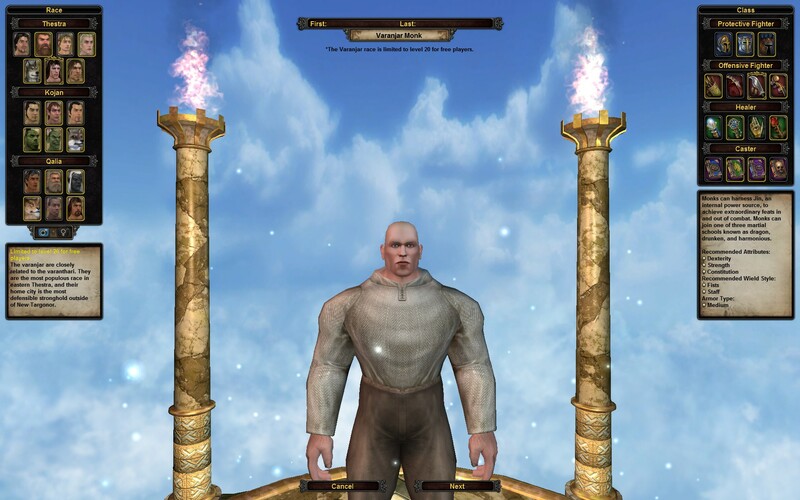 With that inspiring welcome, EVE takes you straight into character creation. I fiddled around there and eventually created several characters, just to see art and ship styles. 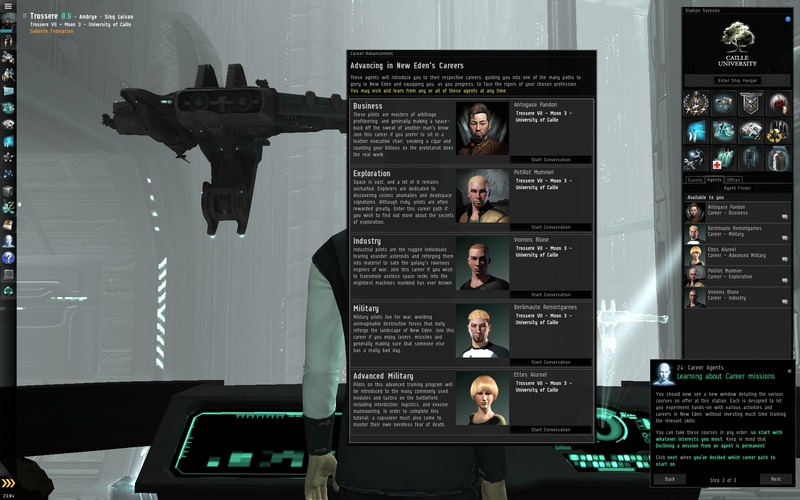 EVE’s character creation is quite detailed and lets you tweak many aspects of your character appearance. It’s ironic you’re the only person that can see your character, other than as a mini-portrait. I believe avatar interaction in space stations is coming up… but for now, the ship you fly is really your avatar. Anyway, soon I found myself in an all-new (to me) view: the captain’s quarters. The tutorial doesn’t waste much time getting you out into space, and within a minute, I had completed the earliest tutorial steps where I picked up my starter ship. 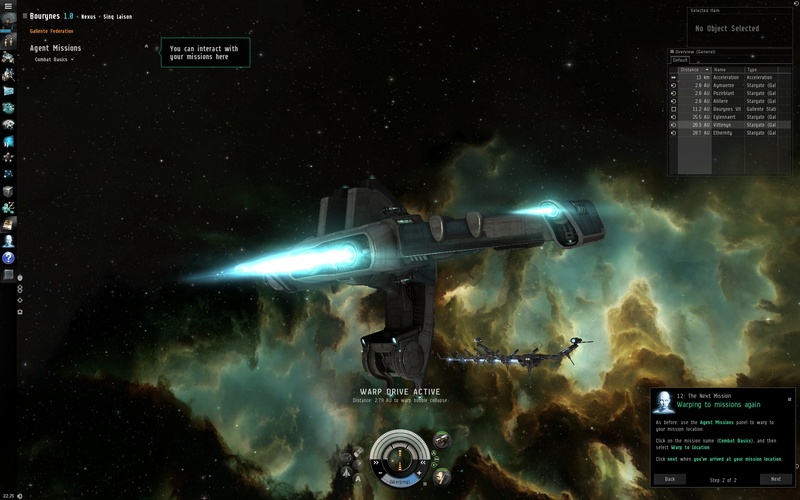 Since I made a Gallente, that ship is the Velator. One of my goals next time I play will be to figure out how to disable the UI. I was swamped enough doing the tutorial to explore the config options too much, sorry! The new tutorial is pretty nice. It contains step-by-step instructions, with the game pointing out where to look for click or where to look for information. 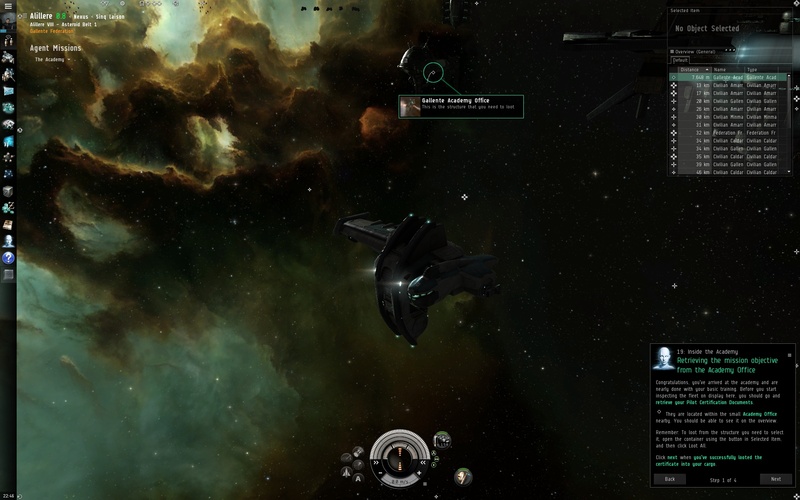 In the screenshot above, what I am describing is the “You can interact with your missions here” floating text in the upper left. 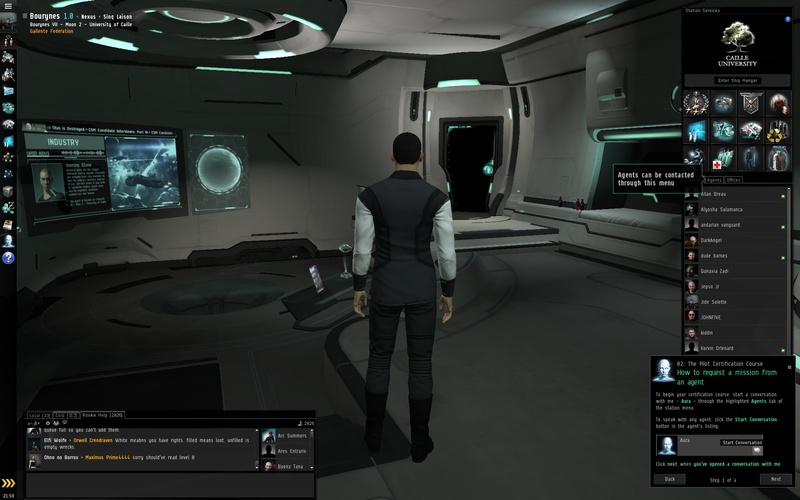 Or in the Captain’s Quarters screenshot, the textbox on the right that says “Agents can be contacted through this menu”. What I remember of 3 years ago was blinking to call attention; that was OK but this is even more noticeable. 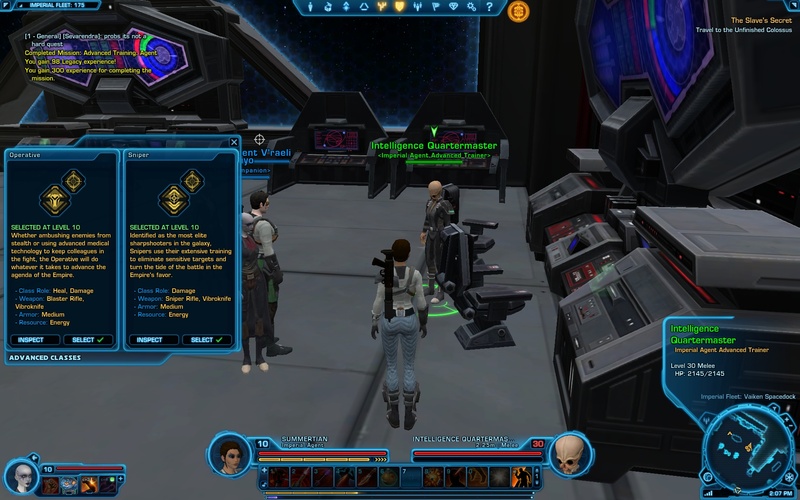 For that matter, I don’t remember your current mission overlayed on the UI at all, I always remember having to click the journal to find info. So that’s a nice leap in friendliness! The combat mission was straightforward – blow up a fuel tank then fight two NPCs. The fuel tank explosion caused ship damage, which provided a quick introduction into using the armor repairer, and a brief overview of shield, armor, structure as the 3 layers of your ship’s defenses. 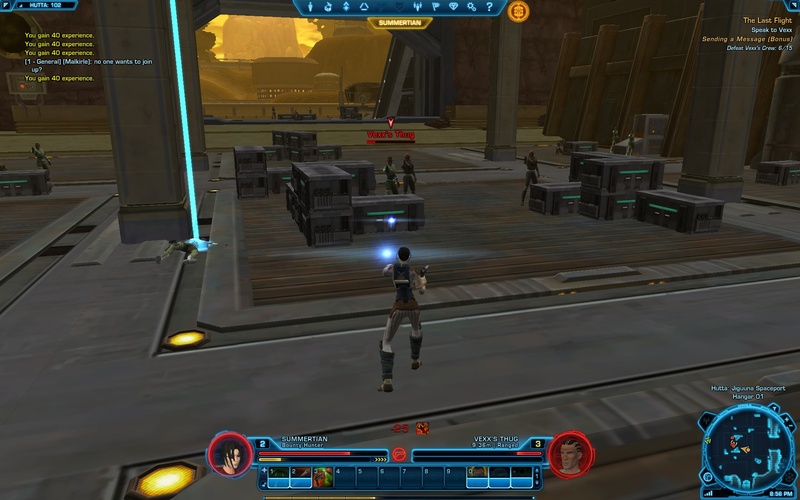 I thought the tutorial was very good, covering fitting modules (the tutorial provides an armor repairer and gun), targeting enemies, using the armor repairer plus needed navigation skills such as interacting with acceleration gates and spaceports, talking to agents and accepting missions, how to loot items, and skill training. From what I remember of doing the tutorial in 2008, this new tutorial is much better. 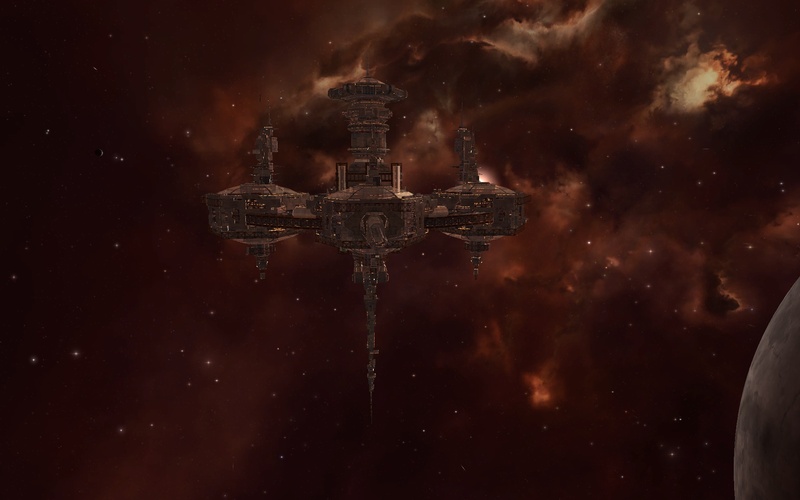 CCP has put in a lot of effort to smooth out the initial shock of playing EVE. It covers a lot and if anybody is starting up, I heartily suggest only doing the tutorial at such a time that you will not be interrupted. I only did the newbie mistake of undocking from the station without accepting the mission one time. 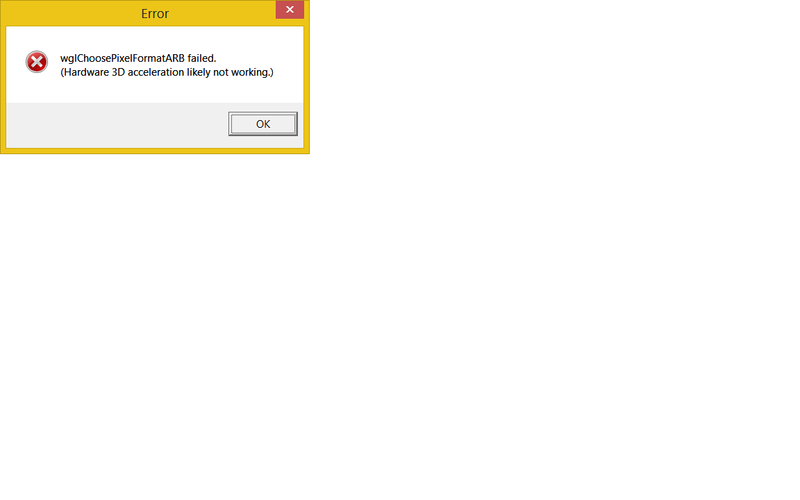 I saw my error and redocked fairly quickly to fix that problem. I also screwed up and set my destination to the mission start, but rectified the error (without the correct destination, the overview doesn’t display the correct waypoint you need to fly to). And I did find one minor problem in the tutorial – in the section about skill training, it tells you to right-click and select “train after current queue”. That option has been replaced by the simpler option “Add”. The tutorial ended with me flying to a nearby station and meeting 5 more agents, each with a mission covering various possible aspects of gameplay. Those areas are Explorer, Military, Advanced Military, Business, and Industry. I will play through each of these, gathering knowledge and hopefully more rewards, and then I’ll see if my coworker and I can meet up sometime. Before logging off I made sure my skill queue has at least a day of skills queued up, so I don’t waste any precious time. I figured out how to hide the UI, and took more screenshots. 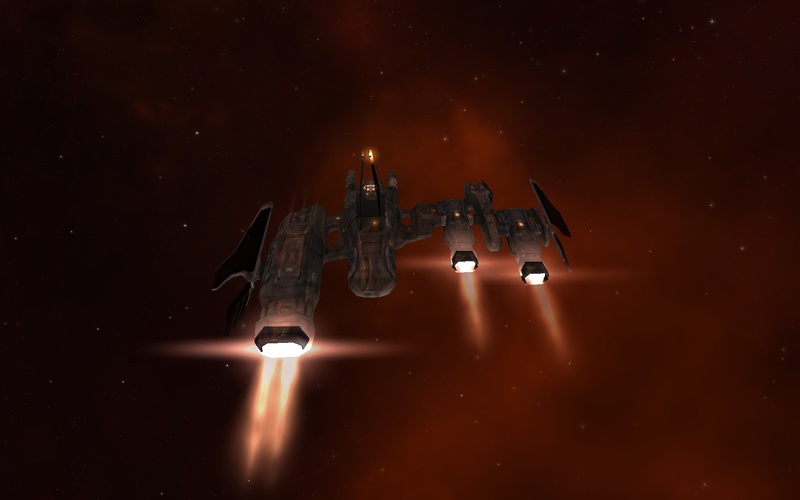 I gotta say, the graphics in EVE always look good to me! If you look at the ships, most aren’t symmetrical. I’m not sure what it is, perhaps years of expectation built up from TV and movies, but a spaceship that doesn’t have at least one axis of symmetry looks weird to me. Modern cars and planes have one axis of symmetry, usually vertical (minus minor things like side mirrors). Horizontal symmetry isn’t typically present here, but then we have gravity and so forth to deal with (i.e. vehicles need wheels on the ground). Now that I look closer, perhaps the axis of symmetry here is horizontal. In any case, I think the ships all look pretty good! My burglar Dhrun has been marooned at Echad Dagoras for a long time, and I decided to take a break from Rohan and move him along. Since he’s level 65 already, I also decided to “bee-line” the Epic Quests for a bit – focus on the epic storyline until it outlevels me. At the very least, that would get Dhrun into Dunland somewhere. I could kick myself for letting him get so far behind but that’s OK, I can peck away at it. Ah of course, so obvious. I’m just going to put this out there, as a general rule – if I am ever in the position of becoming an evil overlord bent on dominating the world, my very first instructions to my loyal minions will be this: do NOT, under any circumstances, build an idol of me. That’s just going to warn the enemy we’re on the way. When I heard Vanguard: Saga of Heroes (V:SOH) went free to play, I mentally added it to my list of games to check out. The only things I heard about this game brought to mind various disasters. 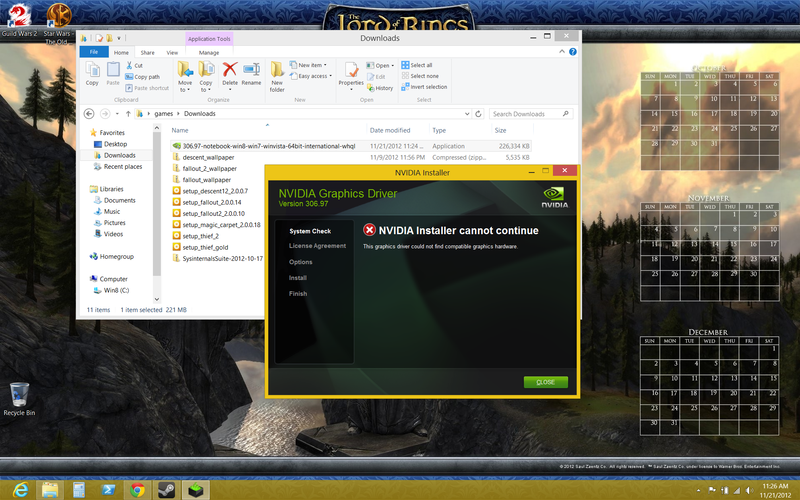 Since it is on Steam, free to play, and runs fine on Windows 8, I decided to try it out. 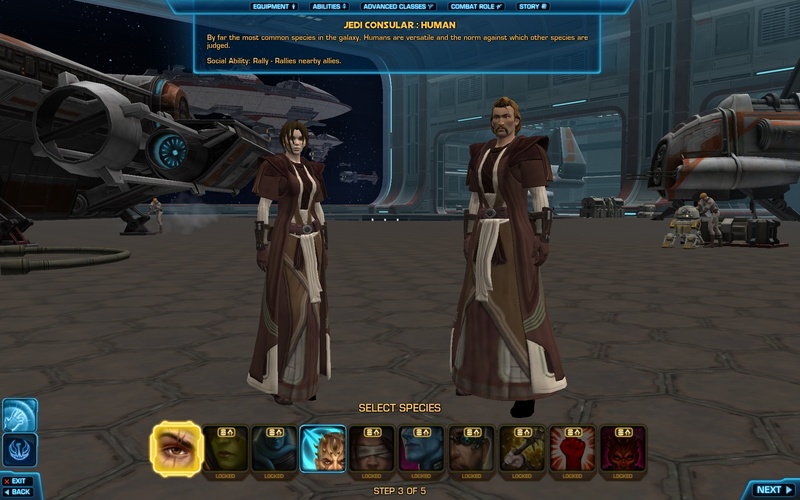 The character creation screen contains a button for each race on the left, a button for each class on the right, and a simple naming dialog in the middle. There is hover text as well, listing various racial benefits. I was excited to see that “Monk” was a class, since my favorite DDO class is the monk. Unarmored (I hope) kung-fu combat, woot! But as I looked at the various character options, I noticed something. Perhaps you will see it too. In case you didn’t notice, the striking difference is the male humanoid characters are dressed, while the female humanoid characters are sporting bare midriffs and large racks. Nice! Oh wait… REALLY? Come on! Anyway, I opted for a female Varanjar Monk, typed in a name, and clicked next. The next screen asked what city I wanted to start in, either Isle of Dawn or my hometown. Not sure if it matters, but given the text (Isle of Dawn – help people, nothing for hometown) I am guessing the Isle of Dawn is the tutorial area, so I should do that. Click Isle of Dawn. Then I was asked what server: Telon or Halgar. Halgar was marked EU so I went with Telon. Click Next. Then I got an error, “That first name is already taken”. WTF?! How about reordering the creation sequence so I pick my name last, and don’t have to cancel and redo a bunch of clicks. Basically I had to click through a bunch of screens to do a name check. That is kind of frustrating. Anyway, I tried “Aurora Tian” – error, first name is taken. I tried “AuroraTian” and no last name – error invalid characters in name. I tried “AutumnTian” and no last name – error invalid characters in name. 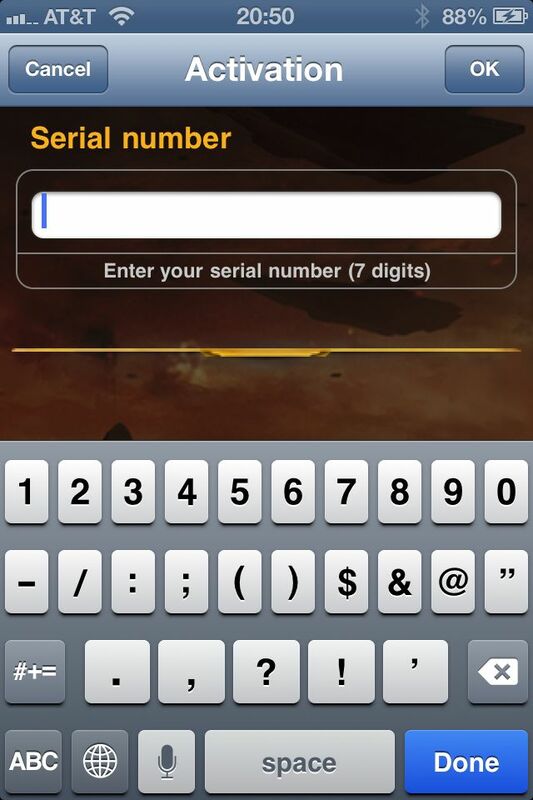 I tried “AuroraTian Tian” – error invalid characters in name. For the love of all that is sane, these people need to borrow ArenaNet’s system where it tells you as you type, whether or not the name is at least legal. Whether it is taken or not is another matter. Looking back, I think the issue was the 2nd capital letter in the first name. Argh! 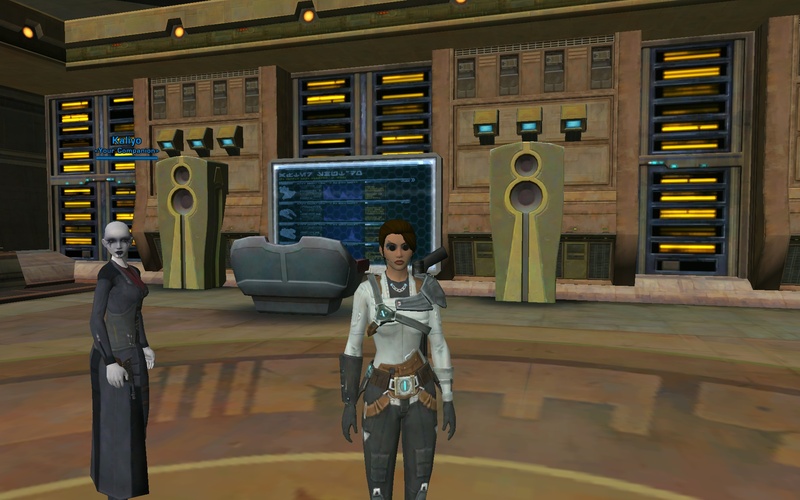 After finally finding a name that was OK (“Melancthe”) I advanced to the char designer, where I picked the hair color and other cosmetic stuff. I just took what was there, not really caring too much. Picking Seeds. 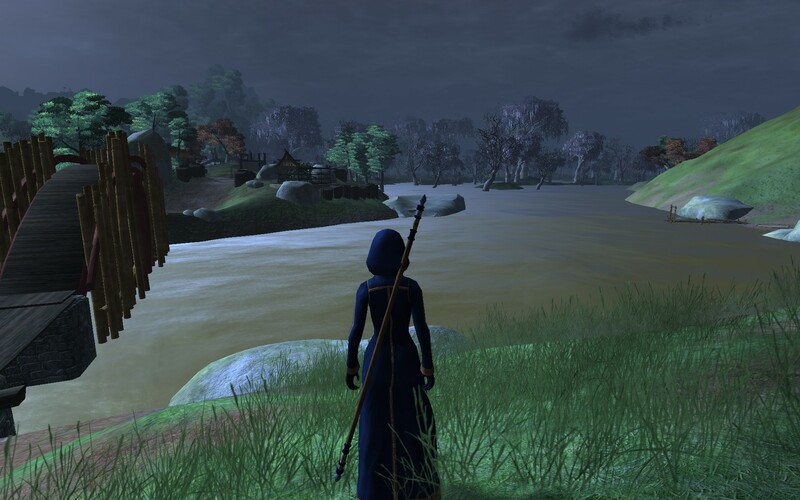 They don’t glow like gather items do in LoTRO. 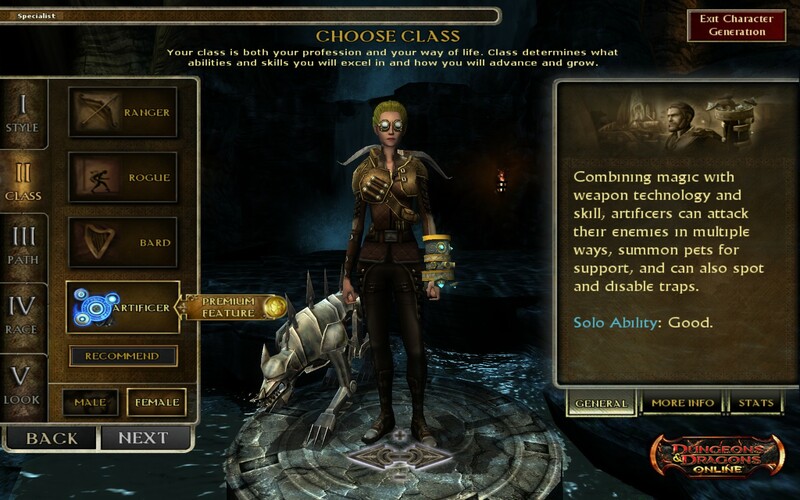 But first, I tried another class, the sorcerer. Soon, I was needing to kill 5 gataro podlings again. I looked over the skills on my hotbar, and I had 3: Auto-attack, Force Barrier 1, and Arcane Balance. Force Barrier was a defensive skill, Arcane Balance was a racial skill that distributes energy among a group, and… Auto-Attack with my staff. I’m a sorcerer and I don’t start off with a way to fight with magic? I attacked, but with my staff damage being terrible, and having no way to heal, I was killed. 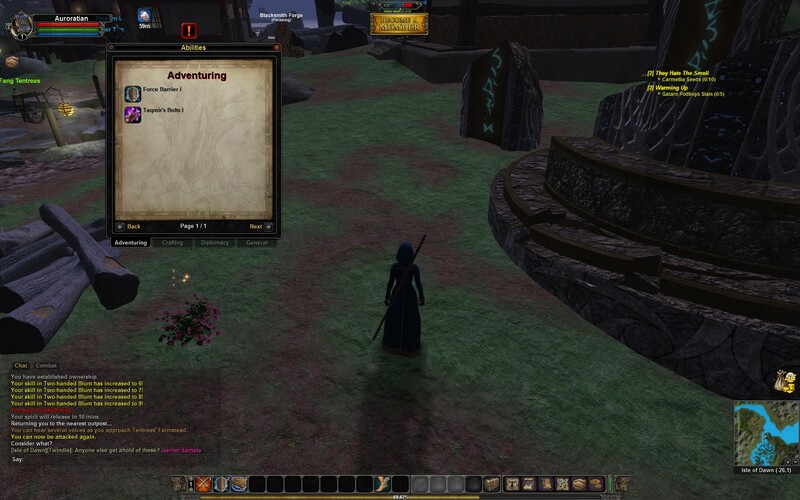 This can’t be right, so I dug around in various dialogs and discovered I did have an offensive spell: Taqmir’s Bolts 1. It’s just that it wasn’t placed on my skillbar so I didn’t know it existed until I went looking. Grrrr. 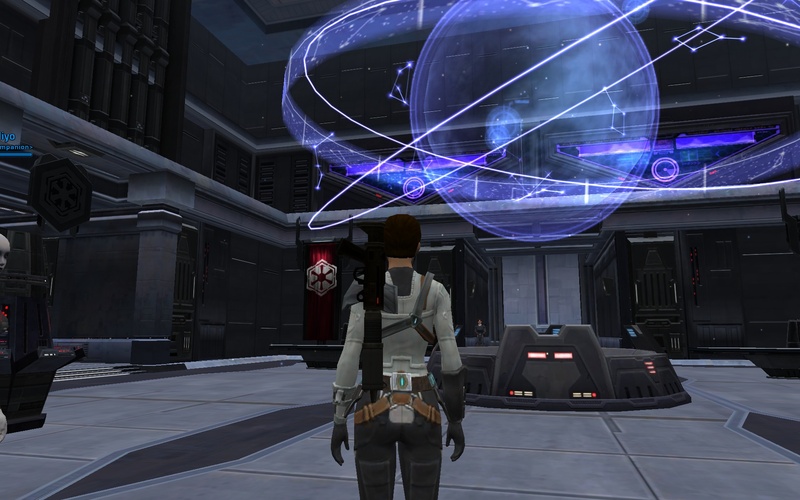 This time, using Taqmir’s Bolts 1, I crush the gataro podlings and finish picking seeds. After meeting my trainer, my new skill is “Frostbite 1”. It was late and I decided to call it a night, taking one scenic screenshot from across a bridge, looking back at the starting village. In addition, I finally figured out how to hide the UI. So the big question is, will I keep playing. Honestly, probably not, and I feel bad only trying it for about 90 minutes total. It just didn’t grab me right off the bat, and I don’t want to invest too much time into leveling up (to get a few more skills) and seeing if the game grows on me. I’ve got a bunch of other games I’d like to try out so I think I’ll just set this one aside for a bit. I would at least like to finish the starter area, and then finish the Diplomacy quest sequence, since one thing I did hear about Vanguard was how great the Diplomacy system (mini-game?) is. The graphics and animations do look dated, especially compared to Vanguard’s modern competition. It should be the gameplay that matters the most, and with only a bit of time invested, it didn’t seem that different from the usual formula. The game released in Jan 2007 so if you consider the bulk of the graphics assets and animations were done a year or two before that… yeah the game does stretch back quite a ways! It’ll be six years old in two more months. I’ve been questing furiously trying to finish up the Brown Lands, Rushgore, Stangard, and so on. I just feel bad about leaving an area “unfinished” on my main character. Now, after reaching kindred rep with Stangard, I have crafted my Great River armor, bought the Return to Stangard travel skill, leveled up my Level 75 Legendary Club and Belt (as a hobbit guardian, I regard any weapon other than a Club, or Great Club for you 2-handers out there, to be barbaric ;)), and am now finally ready for Rohan! OK, small disclosure, I didn’t earn Kindred rep with Théodred’s Riders. In fact, I have a few Nan Curunír quests left to do. But dang it, I can’t hold off going to Rohan anymore. The anticipation is overwhelming me. I’ll come back to get kindred with Théodred, I promise. Yes, only 4-5 weeks after all of Landroval is off riding their War Horses, Naerys finally crossed the river south of Ost Celebrant into Rohan. I haven’t done much, just a few quests in Langhold, but I also worked on the epic quest line and reached 3.7.8, Reading the Signs. I believe that 3.8.1, War-steeds from the Wold, is where I get my war-horse, and I am really looking forward to that! 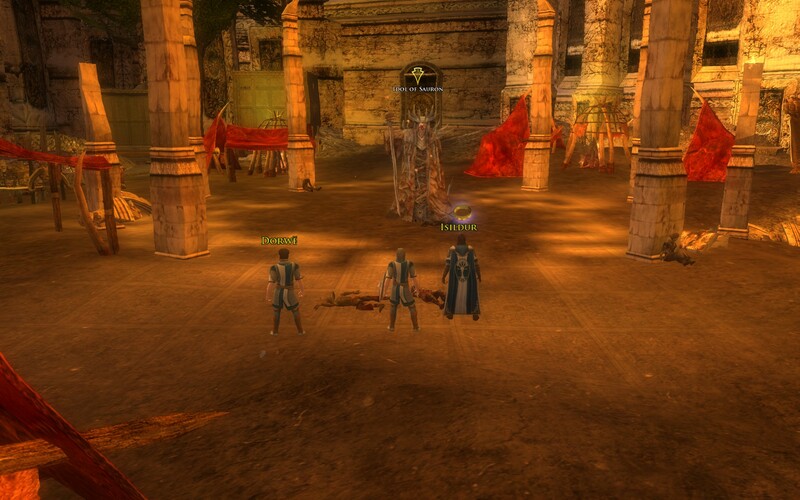 Author mmojugglerPosted on 2012/11/12 2012/11/12 Categories LoTROLeave a comment on Ready for Rohan!